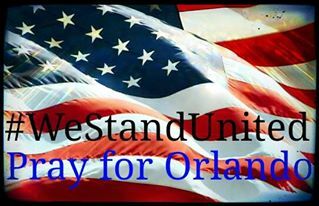 #WeStandUnited In The Face Of Evil-Standing With Orlando-My Two Cents – I Am Not Ashamed Of The Gospel Of Christ! We really truly have entered into perilous times. This will most likely offend some, but I write what God has me to write. As I watched events of the Orlando attack unfold, I also reviewed many news reports and watched comments emerge. Of course Christians were blamed for hatred in some comments. We were blamed for intolerant attitudes, and hatred. Some comments made by Christians said “they got just what they deserved.” I do not advocate hatred. I can not claim to be an advocate and voice for the persecuted and pick and choose whom I speak for, God does that. I can not claim to be the voice of God and not give all His words. He wants His love given now, and I will give those words. It’s time for us to show the world Christ’s love. The love and peace that passes all understanding. Won’t you come to this love? Won’t you come to this promise of eternal life? I may not believe the way that the LGBT community does, I am not Gay, Transgender or bi-sexual or no sexual (binary) I am a Conservative Christian. I have called them out for behavior that the Bible say’s is a sin, but they are humans, humans that did not deserve to die facing and staring in the face of evil. God is the ultimate judge of mankind. We are to judge sin, we are to call it out, but God metes judgement not man. So before you say they are sinners, they got what they deserved, let me say NO, NO WE WILL NOT CONDEMN. We are all Americans, and an attack on one is an attack on all. What I find utterly appalling is the Left PC crowd, and the condemnation they give to Christian Bakers who refuse to give up their faith when serving customers forces this, but they will not, condemn Islam. The refuse. They still find a way to condemn Christians. But we will not stoop to that level, we will show the love of Christ. That said Islam has a violent history against all minorities. Christians, Yazidi, homosexual’s, Jews, and a host of others. I will not condone this behavior. This is a god not known to us. We do not worship the same god as Islam. Of course CAIR and others came out and said, this does not represent Islam. But it does. The father of the terrorist portrays himself as President of Afghanistan, that’s right, he has his own radio station that broadcasts in Afghanistan, and hours before the massacre he was on You Tube in fatigues calling for the arrest of military personal in Afghanistan. He said that he runs Afghanistan from his home in Florida. Hello! This is not homegrown terrorism as our president suggested. This terror is grown from Islam and Afghanistan in particular. The terrorist is an American, whose parents are from Afghanistan. He has a history in the security company he worked for, running one employee away for stalking and threatening him. He beat his wife regularly, and was on the FBI radar and interviewed and found innocent. Really? His father thinks he’s the king of Afghanistan, and rants that the Taliban will rise and gain control over the Pakistan border and they let this guy go? This morning he was on TV stating that Allah will punish homosexual’s. So you begin to get the picture. The media put this man out front after the massacre stating “I’m just as shocked as the rest of America, and this had nothing to do with religion.” Boy do they have egg on their face. CAIR also. This has everything to do with religion, and unless we recognize that we are headed straight down the slippery slope to ruin. Remember the poem from WWll “First they came”. This is exactly what this is. First they came for the homosexual’s and we didn’t care because we weren’t homosexual, well pretty soon there will be no one left to help us. Christians and all minorities are targeted by Islam. This terrorist called 911 while massacring his victims and proclaimed allegiance to DAESH. This is not insignificant. In the Middle East and Islam symbology is very significant, and this sent a symbol meant to drive fear. Pastor Saeed Abidini has been warning about this ideology since his return from Iran and he is receiving hate comments from many stating that he is spreading hate, and is no better than them. He is receiving death threats from Iran, and other Islamists so why would he risk his life? He is a watchman and is warning God’s people. He stated in one of his messages on facebook that unless we reach muslims with Christ, they will reach us with Jihad. He should know he was one before his conversion. We will continue to warn, and as I said before on facebook, if you don’t understand that Americans will unite under attack than you are in the wrong country. If you don’t understand the compassion, empathy, and love Christians show those who are persecuted than you don’t understand the Gospel of Christ. There is only one who can save America, there is only one that protect America and if we turn to Him and repent He will heal our land. If you don’t know Christ won’t you accept Him, and accept eternal life instead of a life that ends in death? Praying for God’s peace and comfort to the victims and their families. This darkness will now find that Americans are united no matter what our belief, unlike the cowards attacking. My heart and prayers are with Florida and the victims. They will not divide us in this manner. We in America are united against this evil ideology. I, too, noticed the absence of condemnation of Islam. It takes a lot more courage to condemn Islam than it does Christianity. Maybe they know the Qur’an and Bible better than we think. Holy Father God…. our Sin is too great and we implore your forgiveness In Jesus Name. Thank you for making a way to be right with you thru Jesus the Final Sacrafice… the final Lamb that was slain …. I plead the promise of Psalm 91 over our world right now Lord God Almighty…. please heal our Land. Use us to bring everyone we can into your Kingdom! Please heal our Land! We Love You and Worship YOUR Holy Name!!! Lauren Daigle….. Come Alive Dry Bones!!! What an article… How unbelievable!!! What is wrong with these people eyes shut and hardened hearts. This is a travesty and to not realize the gravity …. If enough people turn their head and act like its nothing we could have Shariah Law right here. Wake up America!! !… Lord Jesus please Lord God Almighty please heal our Land in Jesus Precious name!! Thank you brother I spent many hours in prayer over this. It shows us how short time is and we should be about our Fathers business showing the love of Christ and winning souls.